Solar Energy can be used in a variety of different applications throughout your residence. 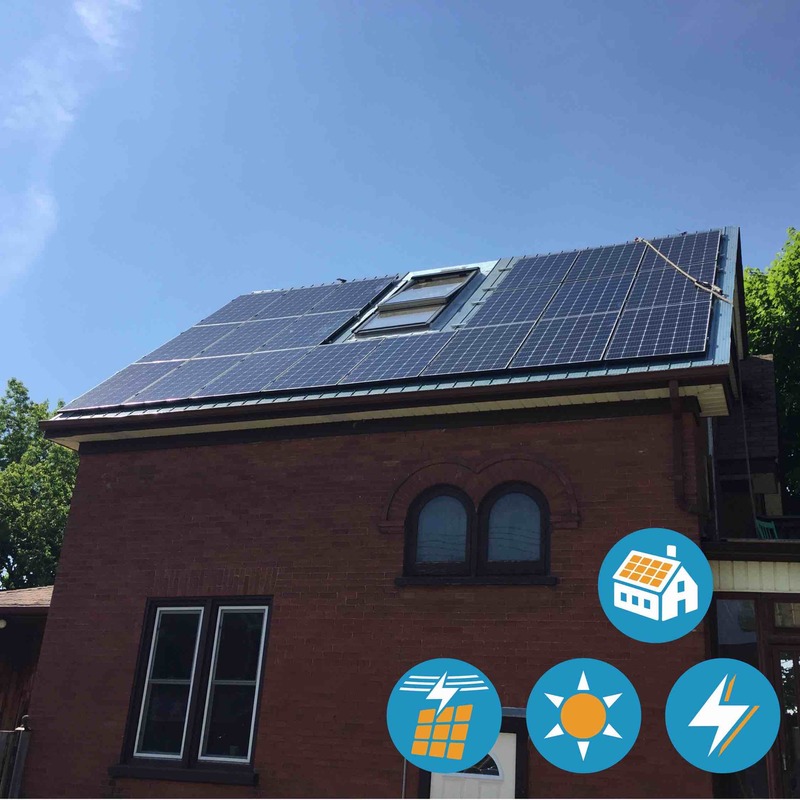 Please explore this page to find out how you can put these applications to work to save you money, and help the environment, all while having the help of the Guelph Solar team to keep your systems working like new. Generate your own clean energy with Solar Photovoltaic (PV) Panels. Reduce or even eliminate your reliance on Hydro. Save up to 90% off your Hydro bill with Net Metering, by sending your excess energy to the grid in return for credits on your Hydro bill. Solar PV panels reduce the impact electric vehicles and appliances can have on your energy bills. 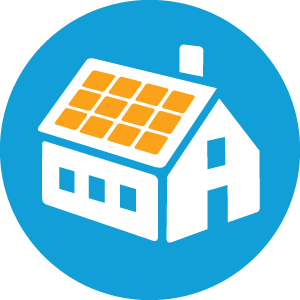 Contact us to learn about your solar options! Looking for a new roof? It is a perfect time to install solar when you are reroofing your home or business. Why not install a roofing and solar solution that lowers your electricity bills and helps the environment at the same time? Guelph Solar’s innovative Premium Solar Roof is a roofing and solar solution that pays for itself! What is a Premium Solar Roof? Simply put it is a Premium Metal Roof combined with a solar panel system that creates a beautiful money saving machine. 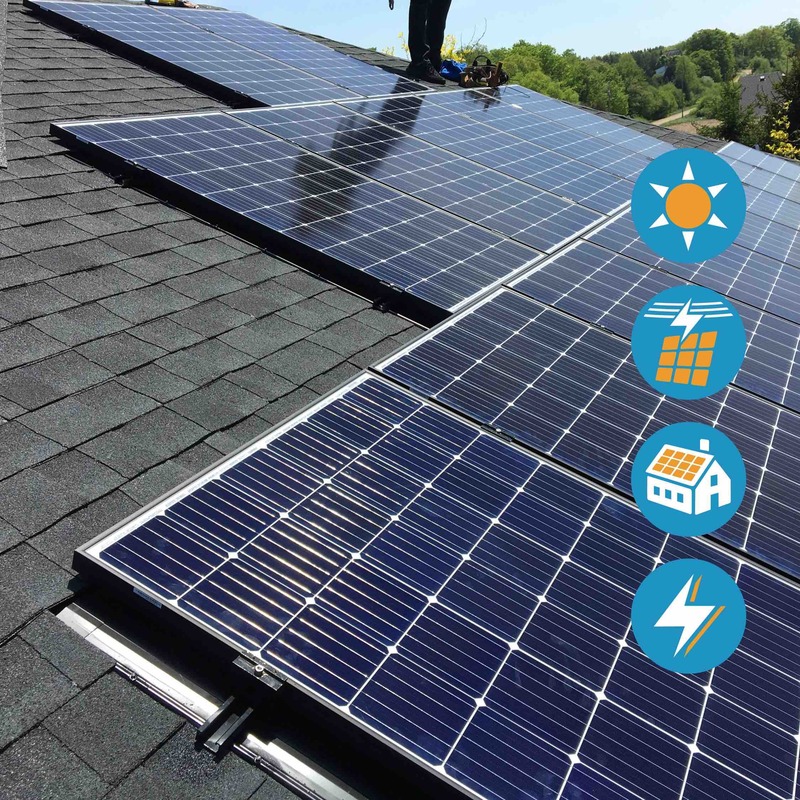 Guelph Solar will install a long-lasting metal roof under your solar panels along with a lower profile racking design that will result in a beautiful, low profile, installation. What are the benefits of a Premium Solar Roof? Low Profile design is aesthetically pleasing and has the added benefit of being rodent proof – no need to buy critter guard for your solar system. Integrates seamlessly with other roofing material including steel, steel tile, asphalt. In the future, if you need to reroof you can reroof around your solar panel system. Reduces the future cost of roofing. No need to remove and reinstall solar panels when reroofing. Extend your summer and eliminate energy costs by running your pool with solar. Guelph Solar installs quality equipment with long warranties. We also service and maintain most brands of solar pool heating systems. Our solar technicians have over 25 years of combined experience dealing with solar pool heater systems. Heat your pool 3-4°C (6-10°F) every sunny day! Save between $700 to $1000 per year on gas heating. Use a renewable energy source. A solar pool heating system is one of the most cost effective and environmentally friendly ways to warm your pool. We hope that you decide to make the investment for your home! To learn more about if solar pool heating is the right option for you please check this blog! Clean your pool with a renewable energy source. Eliminate the electrical costs of a sparkling clean pool. Relax knowing that your maintenance-free solar pool pumping system is a great environmental and economical choice. "I'm just over the moon with how well the solar pool heater works. I can hardly get the kids out of the pool. It was 90F yesterday. And I like how efficient it is. Thanks!" Increase your solar usage with battery backup. Take a look at the Tesla Powerwall Brochure and the Guide for more information. 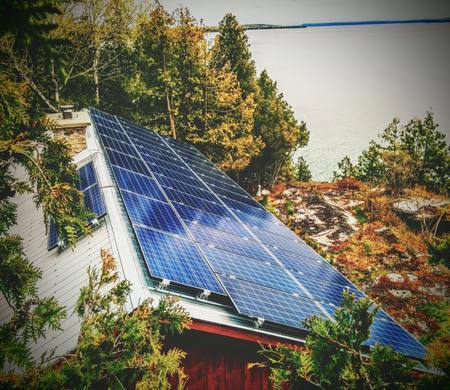 Guelph Solar designs and installs custom off-grid systems with battery backup. Off-grid systems are ideal for cottages or remote properties that have no access to power or where power would be too expensive to install. We also install zero export solar panel systems with or without batteries. 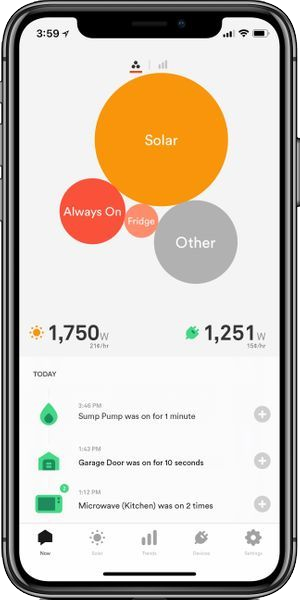 Zero export systems stay connected to the grid, however, the solar energy produced is consumed in the moment, or stored in a battery. A zero export meter is installed to ensure no power is ever exported to the grid. A zero export system is ideal for properties that consume high amounts of energy during the day. Producing your own solar energy is the cheaper and environmentally friendly option. We provide maintenance services for all solar applications: FIT, MicroFIT, Net Metering, Battery Back-up, Solar Thermal, Solar Pool Heating and Solar Trackers. System performance testing and verification on panels and inverters. Snow removal - Please check our blog to learn more about our snow removal services! Repair from pest damage and install guards to keep pests out. To learn more please check our blog! We will always provide you with clear feedback, outlining key issues, a report on performed work and recommendations for moving forward. If you have a maintenance job please contact us to discuss or fill out our Maintenance Intake Form. Here are some common questions and answers. Please get in touch if you have other questions which are not covered here. Yes. We can arrange financing, however, we recommend you first attempt to arrange financing from your preferred financial institution - your mortgage provider, typically - as they will already have a credit profile for you, and you will likely get the best possible interest rate. Do I need to reroof before installing solar? Replacing your shingles right before a solar install is a fantastic time to do it because the shingles will last many years longer with panels protecting them. That said, if your shingles are in good condition, you will not need to replace them, as the panels will keep them protected and in good condition for many years. Does the system have a warranty? Yes. The panels and solar optimizers come with a 25-year warranty, while the inverter has a 12 year, extendible warranty. My house is old can it support solar? Yes an older home can support solar. Before installing we perform a structural assessment and determine if any work is needed. What area does Guelph Solar service? We service Guelph and surrounding region including Kitchener, Waterloo, Cambridge, Burlington, Oakville, Puslinch, Milton and rural areas. We do also service outside of the Guelph region including Toronto and southern Ontario. How much time does it take to pay for itself? Typical payback for a net metered solar system is 12 -16 years. Variables include if you tend to consume more energy during the day when electricity costs are higher, as well as roof orientation and shading. Will a solar system raise my property value? 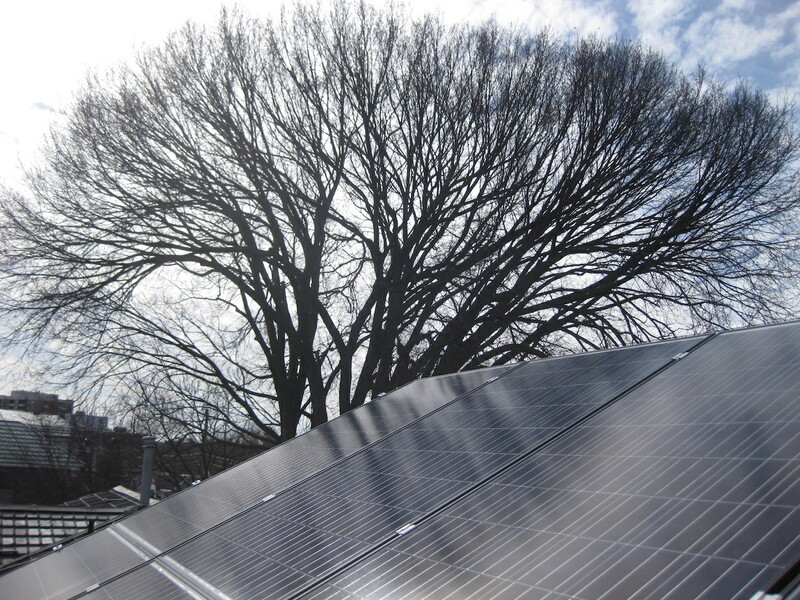 Many reviews are showing that the value of a property with solar is increased. In the United States, the value of the home is increased by $4 per watt of installed solar power (New York Times, Feb, 2016). More research is needed in Canada, but the trend is here too! Maximum production occurs when the sun is highest. On a daily basis, production starts at sunrise, reaches its peak around noon, then declines until it reaches zero at sunset. During the year the sun provides the most energy around the summer solstice (June 20) and the least around the winter solstice (December 20). Weather, snow, shading and other factors will impact production. After we conduct an assessment of your roof, we will show you our predicted month by month energy production for your system. Does the solar provide me with power in the event of a power outage? In the event of a power outage without a battery the inverter will shut down due to anti-islanding regulations needed to protect line workers. Furthermore, in order to output power this grid-tied inverter needs to see 240 volts - which is typically in the form of the grid. 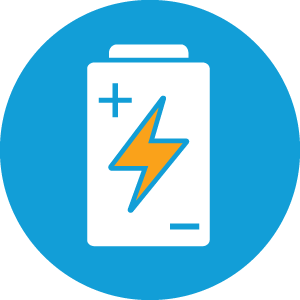 However, the good news is if you have a battery such as the Tesla Powerwall, then the inverter will be able to talk with it instead of the grid and you will be able to power your home in the event of an outage. Please contact us in regards to adding batteries or a zero export meter to your system! How do I know if my roof is good for solar? There are a few factors that determine how great a roof will be for solar, whether you are interested in NetMetering, pool or a battery system. Roof surfaces which face south do best, but we often install on other surfaces as well, and the systems do very well. We use a solar Pathfinder to examine how much shade falls on your roof in different areas throughout the year. We then use this information to determine how much electricity your array will produce each year. Get in touch with us and we can do a free assessment of your roof online. Does Guelph Solar have general liability insurance to cover property damage or injury? Yes, we carry liability insurance and have WSIB coverage. We also adhere to the latest Ministry of Labour Working at Heights guidelines. All of our installation staff have Working at Heights training. Certificates available upon request. How do squirrels damage a solar system? Squirrels can cause damage by gnawing on wires. Pigeons or other birds can make a mess by building nests among the wires. Guelph Solar can help protect your solar panels. We also repair damage that has already been done. How does clearing the snow off my panels benefit me? 15% of your annual revenue for a solar MicroFIT system is made from January to March, it could be more than $700 per year if there was no snow on your panels at all. A portion of your snow clearing cost can be written off as a business expense under your solar contract. For net metering systems, clearing snow will help you save money by reducing your electricity bills. What are the snow clearing plan options? $500 (base cost) for the season: This would include a clearing of your driveway every time there is a snow event with at least 6 cm. This also includes having your panels cleared after a snow fall when several days of sun is predicted (about twice a season). $40 (base cost) per driveway clearing. $75 (base cost) per solar panel clearing. Please see this blog for more information! What brands of solar pool systems do you install? 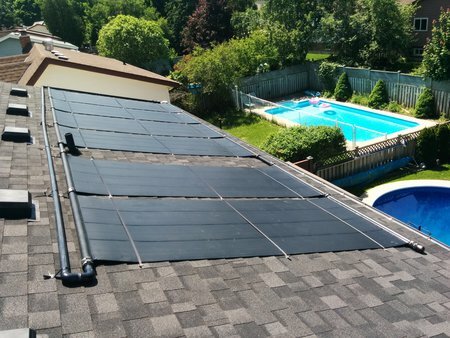 Guelph Solar is a Technosolis and Enersol solar pool heater installer in Ontario. We also maintain other pool heater systems. What is your solar pool heater warranty? Technosolis equipment has a 10 year warranty, Enersol has 18 years. Guelph Solar offers a 2 year workmanship warranty on our solar pool heater installs. What size solar pool heater system will I need? We recommend the area of the solar panels to be equal to half the area of your pool if you are also using a solar blanket. I have an indoor pool – what are my options for solar pool heating? A solar pool heater system will also work great for an indoor pool. It will extend your pool season by a couple months and lower your costs. What equipment do you use when installing a solar pool pump system? We use Lorentz pool pumps. The two sizes are available with flow rates of 19 or 36 m3/hr. The pool pump is powered by Canadian Solar panels with 25 year warranties. Can I still have a solar pool heater if I am heating my pool with gas? Yes. Solar is a great supplement to a gas, natural gas or propane heater. Installing solar will greatly reduce the amount of gas you will need. Having both systems helps to extend the pool season even more. Often times the early spring is good having the gas heater to pump up the heat and the solar will maintain and extend it throughout the season. There is no need to have both but it certainly has its benefits.